As it turns out, a cat walking on a leash isn’t some senseless gimmick. Many felines find great pleasure in time spent outside, enjoying the sounds of birds chirping and the scent of freshly cut grass, just like humans do. Even more, that activity can help strengthen the bond between a cat and his owner, giving the pair something to experience together. Sherry Woodard, a longtime animal behavior consultant at Best Friends Animal Society, spoke with The Huffington Post to explain why every cat should be given the chance to step its paw out into nature. Walking a cat can provide your pet with a more enriched life. “A lot of cats love to go outside and smell things, see things and roll around in sand and grass and dirt. They love to scratch real trees. Those are things they can do on a walk,” Woodard said. When out for a walk — rather than prowling an apartment — a cat will use his brain in different and more thoughtful ways. “The cat is thinking more. It’s thinking about how to use its body and what things smell like. The cats are brighter and engaged,” said Woodard. The fact that the two of you will be exercising is an added bonus. “A lot of cats may lack confidence, but they gain it once they’re harnessed trained,” Woodard explained. Given the chance to explore their surroundings, some cats become more comfortable in their day-to-day lives. Not all cats will comply with your leash desires. And that’s OK. If a cat shows no interest in the great outdoors, his decision should be respected. For the sake of safety, it’s crucial to start training indoors, Woodard said. She suggests purchasing a harness and leaving it inside the house for your cat to play with and smell, so he isn’t afraid of it. Next, strap your cat into the harness and make sure it’s properly fitted and that your pet is comfortable. Then let kitty wear the harness around the house. Let him drag the leash and grow accustomed to having something strapped around his body. Woodard said it’s smart to reward your cat with treats throughout this process; give him a spoonful of wet food while you’re first adjusting the harness so he’s distracted. Once you are ready to take things outside, let your cat sniff around and choose the direction (while you are holding on to the leash). Ideally, the first outdoor space should be enclosed with a fence and not be filled with stimuli. 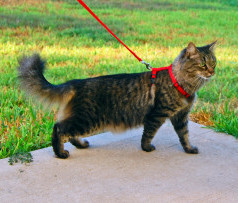 Once your cat seems comfortable on the leash, add walking to the long list of things you like to do together. Make sure your cat doesn’t become an escape artist. Woodard said that once they get a taste of being outside, some cats may wait by the door and attempt to run out once it’s opened. Make it clear to your cat that the only time he can go outside is when he is dressed in the harness. If your cat isn’t into leash life, but you want him to enjoy a new space, Woodard said to consider a catio — an enclosed outdoor space where your cat can walk around freely. Sounds liberating, doesn’t it? You might build a catio on your terrace or in your yard and enjoy the space together. This can also fortify your connection. You can also look into cat fencing, a cat bag or a cat stroller — they’re are all ways to give a timid cat the opportunity to safely smell and hear the world.